We are continuing to refine the telescope. Recent work has included more accurate leveling of the air bearing, and installation of a mylar cover to protect the mercury surface from wind. These improvements have improved the resoltuion of the telescope. The latest image, taken on the night of Nov 28, have a resolution of 1.4 arcsec (FWHM) - very close to the atmospheric limit for this site. The Large Zenith Telescope project began in 1994, as a collaboration began between scientists at UBC, Laval University and the Institut d'Astrophysique de Paris. The aim was to develop a zenith-pointing telescope employing a rotating liquid-metal primary mirror of at least 5-meters diameter, with which to conduct astronomical surveys. Since that time, the project has grown to include astronomers at the State University of New York at Stony Brook and Columbia University. The principal scientific goals of the project are to measure spectral energy distributions and redshifts of over 100,000 galaxies and quasars, and to detect distant supernovae. These observations will allow us to study cosmology, the large-scale structure of the universe, and the evolution of galaxies. In order to simplify logistics and reduce cost, we chose to situate the telescope on a hilltop in the UBC Malcolm Knapp Research Forest, approximately 70 km East of Vancouver. The 6-metre aperture of the telescope makes it the third-largest optical telescope in North America. It's rotating liquid mirror, weighing approximately 3 tonnes, is the largest ever built. The telescope was completed in the spring of 2003 and engineering tests are underway. Scientific observations are expected to begin in the spring of 2004. The program is funded by the Natural Sciences and Engineering Research Council of Canada, with additional contributions from UBC and the partner institutions. As illustrated in the the sketch above, the main components of the telescope are a horizontal primary mirror attached to an air bearing, a detector and corrector lens located at the focus of the primary, and a steel support structure and control system. 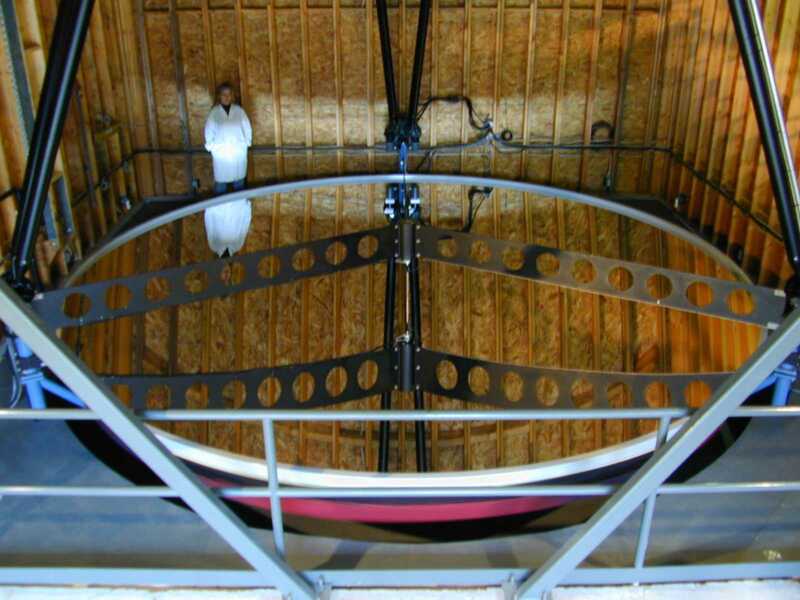 A key component of the telescope is the air bearing that supports the liquid mirror. As existing bearings do not have sufficient capacity for mirrors larger than 4m diameter, a new bearing was developed for the LZT by Professional Instruments Co. of Minneapolis. Made from stainless steel and weighing almost two tonnes, the bearing's internal surfaces are machined to micro-inch precision. Its 56-cm diameter spindle can support a 10-tonne load. The mirror is turned by a built-in brushless DC motor. An optical encoder provides feedback to the control system. With closed-loop control, the rotation speed can be precisely controlled to within one part per million. The primary mirror consists of a rotating steel truss and 30 adjustable pads that support a 6cm thick dish. The dish is fabricated from seven hexagonal segments, plus six smaller pieces, glued together to form a shell 6.1 meters in diameter. These are made from high-density PVC foam covered with fiberglass. The foam cores were formed to a concave shape, with 18-metre radius, by heating to 100C in a large oven. The upper surface of the dish is formed from pure epoxy. A wall at the rim of the mirror prevents mercury from spilling. The diameter of the reflecting area is 6.00 meters. The telescope structure consists of a hexapod - six support legs attached to a ring - which supports the corrector lens and detector. A linear actuator is attached to each leg of the hexapod which allows the length of each leg to be adjusted with a precision of 10 um. 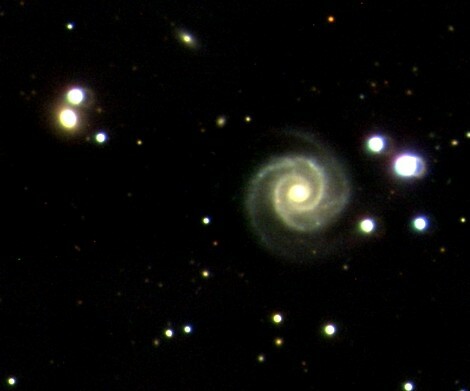 These adjustments are computer controlled and allow the position and orientation of the corrector and detector to be precisely adjusted for alignment and focussing of the telescope. The observatory building is a wood/steel structure employing a steep wedge-shaped roof that rolls back on steel tracks to uncover the telescope bay. The bay is a 7-metre square, 1-metre-thick, concrete pad surrounded by concrete walls and is sealed as a precaution against accidental mercury spillage. A small utility building, connected by an underground conduit contains a compressor which provides air to the primary mirror bearing. The telescope is operated from a separate control room located at the front of the building. The observatory is located in the UBC Malcolm Knapp Research Forest in Maple Ridge, British Columbia. It is accessible by foot and is a 45 minute walk from the gate. At the present time we cannot accommodate public tours except by special request for small groups. Please contact the Project Director, Dr. Paul Hickson, at 604-822-3853 or by email to hickson'at'physics.ubc.ca. When regular observations begin, images from the telescope will be posted on this web site.